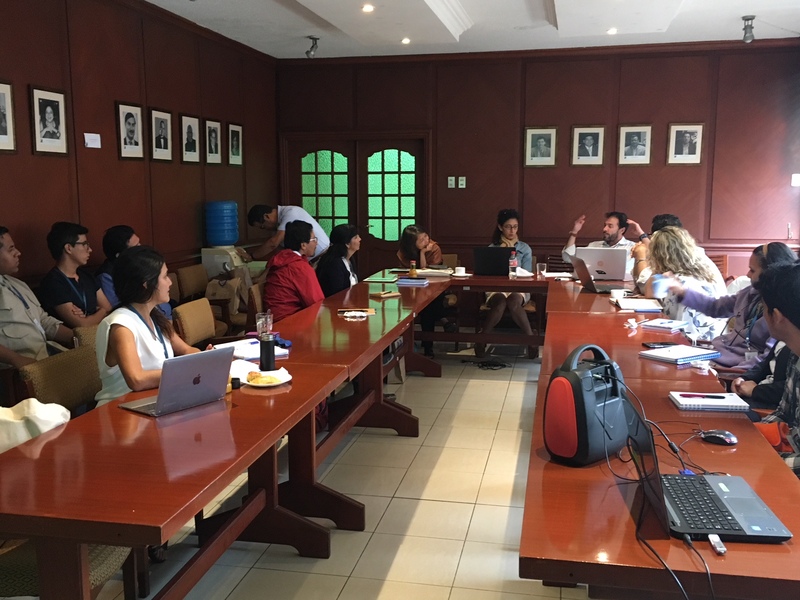 On February 4 and 5, 2019, several TBTI members met in Guayaquil, Ecuador to discuss ways of building collaboration between government departments, researchers and civil society organizations to address issues and concerns affecting small-scale fisheries in Latin America and the Caribbean. 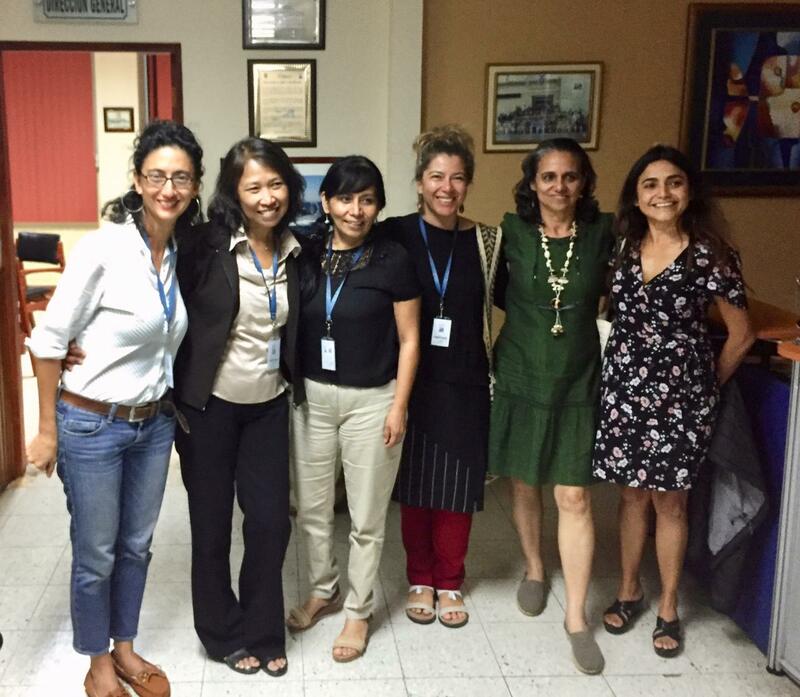 The meeting was hosted by the National Fisheries Institute and coordinated by María José Barragán Paladines, TBTI cluster coordinator. The group exchanged experiences and lessons in small-scale fisheries management in Colombia, Ecuador and Mexico, and discussed the role of the Information System on Small-Scale Fisheries (ISSF), research collaboration, and the transdisciplinary training in enhancing local and regional capacity to implement the SSF Guidelines and to improve the overall fisheries governance. A detailed report from this meeting will soon be available on our website. On February 5, TBTI also held a seminar at the National Ecuadorian Fisheries Institute. 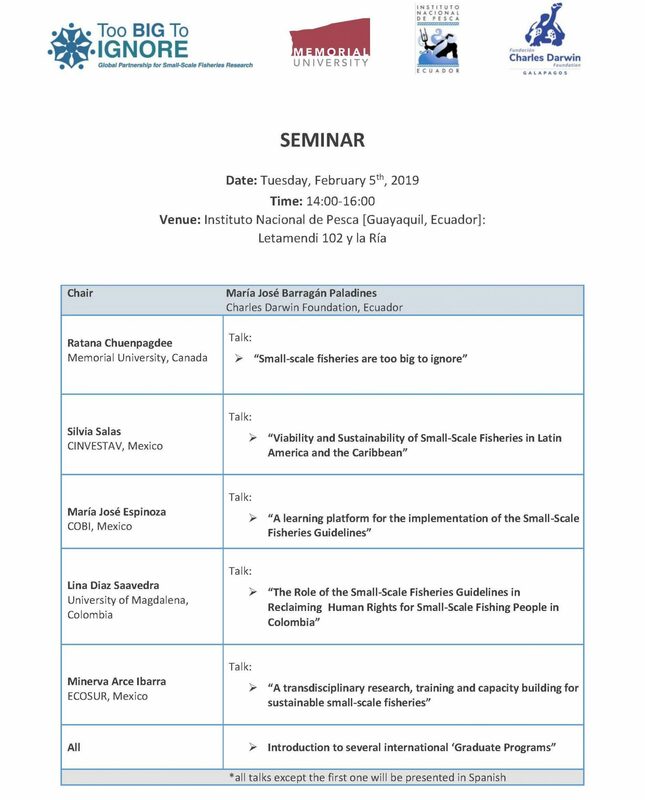 The seminar showcased the past and current activities in TBTI, in particular those in Latin America and the Caribbean, drawing lessons from the recent TBTI book on 'Viability and Sustainability of Small-Scale Fisheries in Latin America and The Caribbean' (Salas et al. 2018). The meeting concluded with a summary of the next steps to be achieved for sustainability of SSF in the LAC region. Written by Minerva Arce-Ibarra (ECOSUR, Mexico). To see the original article in the ECOSUR news, click HERE. Del 3 al 5 de febrero de 2019 colaboradores del proyecto "Too Big to Ignore: Global Partnership for Small-scale Fisheries Research"(TBTI) tuvo su reunión sobre su planeación estratégica 2019 para Latinoamerica y el Caribe. Entre las principales estrategias acordadas para este año está que TBTI Latinoamérica y Caribe trabajará con las autoridades de pesca y centros de investigación de Ecuador, Colombia y México para promover un ejemplo de la implementación de las "Directrices Voluntarias de Pesca-FAO 2015". La reunión tuvo lugar en el Instituto Nacional de Pesca (INP) de Ecuador, ubicado en la ciudad de Guayaquil, donde su directora general, Mgtr. Pilar Solís Coello y el doctor Nikita Gaibor, subdirector técnico científico, fungieron como coorganizadores del evento. En este encuentro estuvieron presentes varios miembros del Proyecto TBTI-LAC, incluyendo a Ratana Chuenpagdee, directora de TBTI, Newfounland University, Canadá; por México, asistieron Minerva Arce de ECOSUR, Silvia Salas del CINVESTAV-Mérida y José María Espinosa del Comunidad y Biodiversidad AC. Además participaron Lina María Saavedra de la Universidad del Magdalena, Colombia, y José María Barragán de la Fundación Charles Darwin- Islas Galápagos, Ecuador. ← What impact might international trade agreements have at the local level? The example of CETA and its implications for Newfoundland and Labrador’s fisheries.